Electronic Kit School. - This is electronic circuit of 12V to 1 - 8 Volt, 100mA SCR DC to DC Converter using S6008 SCR that we get from evaluation circuit of SCR (Reverse Blocking Thyristors) DC to DC Converter as switching devices for this DC to DC converter. In here beside we give you circuit of 12V to 1 - 8 Volt, 100mA SCR DC to DC Converter Circuit using S6008 SCR, we also will show the component parts of this circuit and describe about the working of this circuit. Circuit like in Figure 1 above show you about the 12V to 1 - 8 Volt, 100mA SCR DC to DC Converter Circuit using S6008 SCR. 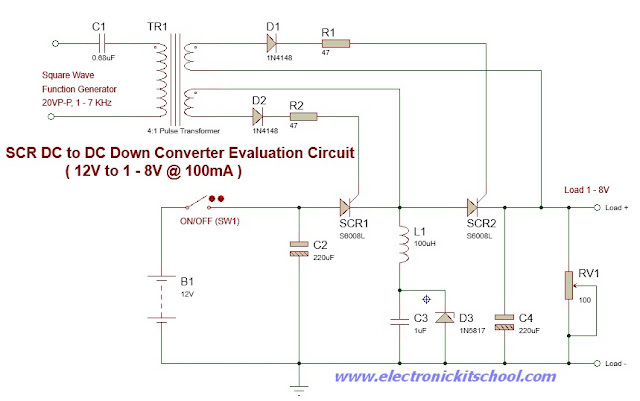 The main component used in this circuit is SCR served as the DC to DC Converter. According Electroschematics site describe that A two phase clock (gate pulses) is generated by a function generator that outputs a square wave. The limited V*uS product of the pulse transformer (and effect of C4) tend to differentiate the square wave signal thus generating 10us trigger pulses. One SCR is triggered on the positive edge while the other is triggered on the negative edge. When SCR1 fires, C2 charges via L1 and rings up to approximately twice the input voltage (24V). At that point, the series resonant circuit attempts to ring back, but is limited by the blocking effect of SCR1 –at this point, SCR1 commutates. Upon the subsequent edge, SCR2 is triggered and discharges C2 into C3 via L1. Since C3 is much larger than C2, the charge contribution of C2 is relatively minor, causing the output voltage to increase only a fraction of a volt. When C2 is discharged to below zero, D3 clamps the voltage to -0.5V and the current through L1 continues to flow until it decays to zero. At this point, SCR2 becomes reverse biased and commutates. Then the process begins again –and runs at several kHZ. This frequency may be controlled either manually (this discussion) or automatically regulated (future discussions).